Teens and young adults who are newly prescribed ADHD medications face a higher risk of psychosis. That’s according to a large study conducted by Harvard Medical School and McLean Hospital. DETROIT — Teens and young adults who are newly prescribed attention-deficit/hyperactivity disorder medications face a higher risk of psychosis, according to a large study conducted by Harvard Medical School and McLean Hospital in Belmont, Massachusetts, and published in The New England Journal of Medicine . Question: Which drugs are causing this and how high is the risk of psychosis? The risk of psychosis really depends on the medication. So researchers looked at two classes of drugs used to treat ADHD —amphetamines, which are sold as Adderall and Vyvanse, and methylphenidates, which are sold as Ritalin or Concerta. Now the study included over 221,000 people who were prescribed these medications for the very first time, and who were between the ages of 13 and 25. And overall, one out of every 660 patients had a psychosis episode not long after starting a stimulant. But surprisingly, the researchers found a big difference between the two classes of drugs. Amphetamines actually doubled the risk of psychosis when compared to methylphenidates. 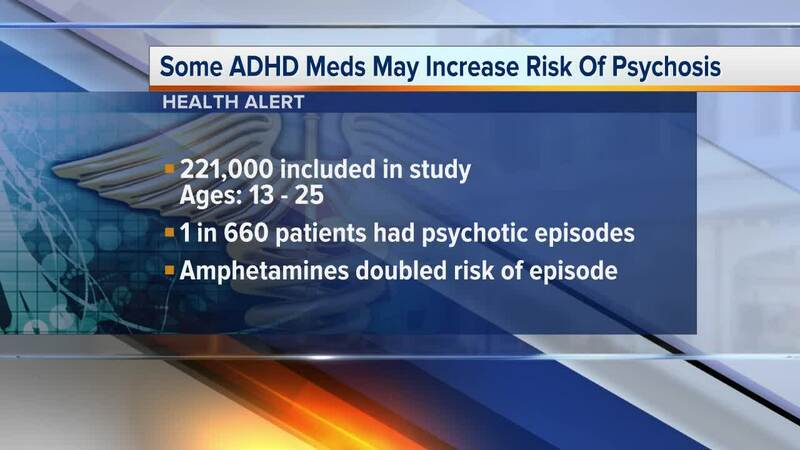 And the reason why this is concerning is that there are a whole lot more people being diagnosed with ADHD. And amphetamine use among young teens and young adults have more than tripled over the years. Question: Can you explain more about psychosis and what one might experience? Psychosis is not good, what happens is that you lose touch with reality. Your thoughts and perceptions are disrupted, and you can experience delusions, hallucinations, paranoia and possibly hear voices. Recovery typically takes two weeks but sometimes can take two months. Having said all that, it’s important to know that the overall risk of experiencing psychosis is still considered rare. Question: What about for the people who are already taking amphetamines? If you’ve been taking Adderall or Vyvanse as prescribed and you’re doing fine, then there’s no reason to be concerned. The point of all this is to raise awareness about the risk of psychosis for new patients. And to make sure that you or your loved one are properly diagnosed and have considered all treatment options, including behavioral therapy and non-stimulants, before taking these drugs. And remember, it’s very important to treat ADHD so that children and young adults can thrive in life. Because if left untreated, it can cause many difficulties socially, academically and emotionally.